The 'Racing Honda' burned through the morning fog to reach the destination of the 'Copper Skillet in Martine California. This morning we were going to try the pork chops at this fine eating establishment to further our quest to find the best pork chops in the land. 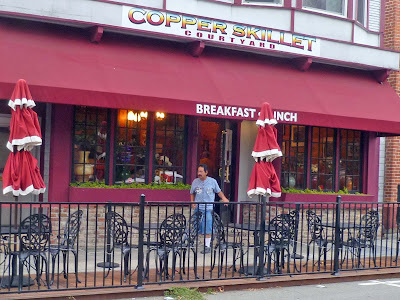 The Copper Skillet is located several blocks from the County court house. There was outside dinning but we opted to warm up inside. We were greeted with booth seating and some pedestrian hot coffee. The coffee was hot and served its awakening duties. The menu was fairly large with many breakfast combination. You probably can guess what was ordered. The pork chops had beautiful grill marks. These chops were juicy, tender and had that kiss of carmelization that can only be achieved by a smoking hot grill. They were very enjoyable. The bisquits and gravy did not compliment but were a slight disappointment. The gravy was studded with little decent tasting circles of breakfast sausage. The sausage could not rescue this under seasoned flat gravy. This lackluster gravy covered some bisquits that had seen better days. Believe it or not I did not even finish the bisquits and gravy. 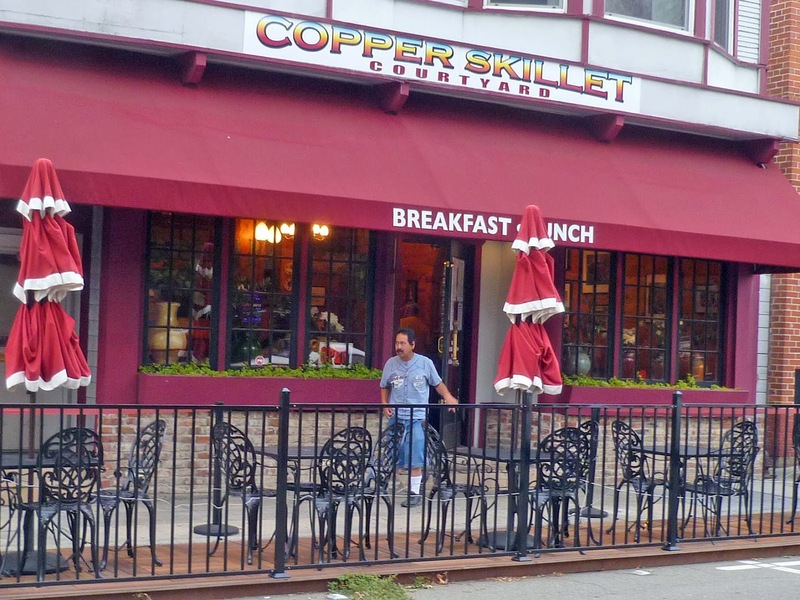 The Copper Skillet serves breakfast and lunch. I would return to have pork chops but will pass on the bisquits and gravy. The quest lives on. Pork Chops are one of my favorite things to have for Breakfast. These look great, I'd be racing through fog also. Lea Ann, I would venture you would be racing through snow about now. Pork Chops Rule!!!! A weak gravy is sad. I mean you just need salt, pepper, and sausage. 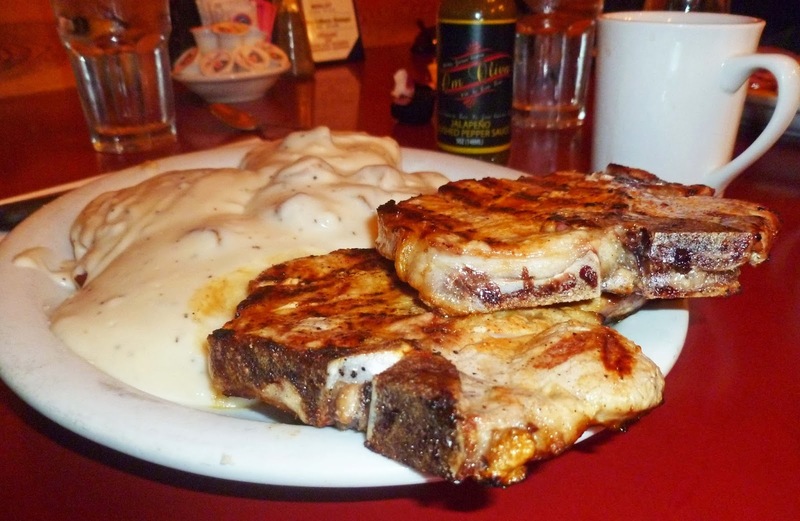 But the pork chops do look great. Chris, As an old friend used to say: "It's all about the gravy,mang"
Maybe I never had a really good B&G. I guess I am more of a hash-brown kind of guy. Those porky chops beg to be eaten! Three Dogs BBQ, Bacon Fat will save the World. Greg, I have had my share of mediocre B&G but when you taste the real thing you will be hooked.